I have a long standing love affair with these plants. And I know I am not alone. 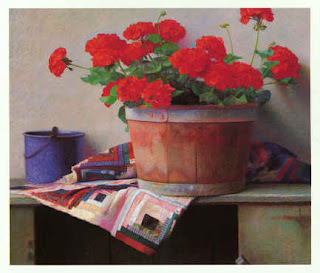 The flowers we commonly call geraniums are actually Pelargoniums by name, but we stubbornly continue to call them what we want to, and that is how they are sold in garden centers and nurseries everywhere. -and I have tried many of them. My favorites remain the scented ones and the flashy looking garden geraniums that, though they are perennials, are grown in my climate as annuals. How duplicitous of them! Equal in enjoyment are the less obvious visually, but more seductive in fragrance: the scented-leafed type. Those plants known as ‘scented geraniums’ have a special place in my heart. They come in an array of fragrance mimicry such as rose, chocolate mint, nutmeg, etc. Both vining geraniums, used for hanging containers, and scented geraniums have smaller, looser flower umbels. The varieties for hanging containers have bright colors and their leaves often have an ivy form. In contrast, most of the scented geraniums are subtle pastels. Many of the scented ones make up for that with variegated foliage. It is the lovely and interesting smells that are the attraction, though. As mentioned before, from rose to chocolate, to citrus, and many more scents that can be either familiar or obscure. It is an olfactory adventure! These geraniums belong to the family Geraniaceae, and are native to South Africa; they like sun, but some grow in part sun, and like magnesium in the rich, loamy, slightly acidic, well drained soil they prefer. (Reportedly too much nitrogen reduces the scent of the fragrant ones, though). The other Pelargonium type I favor, the bedding geraniums or “zonal”, usually find a place in my containers and dooryard gardens. Reputedly the white flowered ones are supposed to stave off Japanese beetles, and companion plant with roses…but I am sure they would do nothing against the type of infestation of Japanese beetles I suffered last year. I favor the bright reds, but have often used the salmon and pink colors in conjunction with blues and whites in the front entry dooryard garden. They do well in the hot dry conditions of a Midwest summer, and don’t ask for alot of attention while producing a parade of flowering beauty all summer. I have overwintered my plants in times past, but had the bad luck ( due to my own lazy nature) to lose them, so this year I will begin again to collect my favorites: maroon flowered ivy leaved one, deep red zonals, and a collection of scented ones.